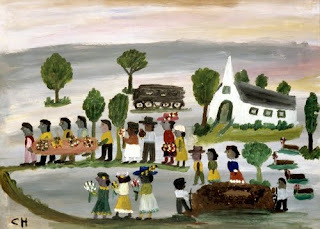 Today’s post in my series on artists from the exhibit Two Centuries of Black Art features Clementine Hunter. 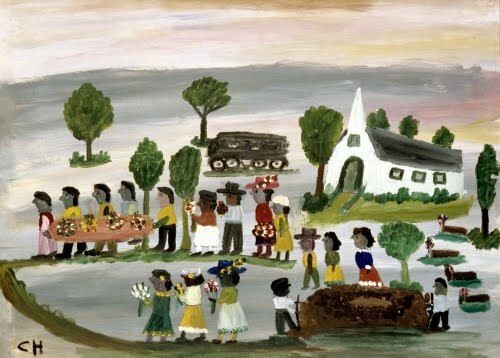 American art is blessed with many a self-taught artist who have contributed immeasurably to a greater understanding of some of the fascinating cultures that most people pass by every day and never notice. If I had not studied the work of Clementine Hunter, I never would have found out about the amazing jewel called Melrose Plantation. It was built in 1796 by the son of a thriving business woman who was a freed slave. Although it was subsequently bought by others, during the early 1900s the owners encouraged writers and artists to settle there. Hunter was born on Hidden Hill Plantation in Natchitoches, Louisiana, but moved to Melrose when she was twelve to be a field hand. She then became a housekeeper and cook. The region of the Cane River where Melrose was located was called the Isle Brevelle Creole of Color Community because of the many freed slaves and persons of mixed race who had established prosperous businesses. Hunter was among the numerous artists to move into the main house of the community. Hunter initially produced quilts that were greatly admired. When she was 42, she came across some paints discarded by another artist and the rest is history. Although she never learned to read or write, she told numerous stories of the Cane River culture through the roughly 4000 paintings she produced in her career. She was the first African American woman artist to have a one-person show at the Delgado Museum of Art in New Orleans. Tomorrow we’ll take a look at Joshua Johnson and his work featured in the exhibit.